The rapid proliferation of cyber crime is increasing the demand for digital forensics experts in both law enforcement and in the private sector. In Digital Archaeology, expert practitioner Michael Graves has written the most thorough, realistic, and up-to-date guide to the principles and techniques of modern digital forensics. Graves begins by providing a solid understanding of the legal underpinnings of and critical laws affecting computer forensics, including key principles of evidence and case law. Next, he explains how to systematically and thoroughly investigate computer systems to unearth crimes or other misbehavior, and back it up with evidence that will stand up in court. 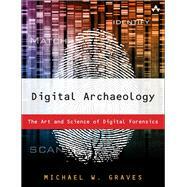 Drawing on the analogy of archaeological research, Graves explains each key tool and method investigators use to reliably uncover hidden information in digital systems. His detailed demonstrations often include the actual syntax of command-line utilities. Along the way, he presents exclusive coverage of facilities management, a full chapter on the crucial topic of first response to a digital crime scene, and up-to-the-minute coverage of investigating evidence in the cloud. Graves concludes by presenting coverage of important professional and business issues associated with building a career in digital forensics, including current licensing and certification requirements. Digital Archaeology is a key resource for anyone preparing for a career as a professional investigator; for IT professionals who are sometimes called upon to assist in investigations; and for those seeking an explanation of the processes involved in preparing an effective defense, including how to avoid the legally indefensible destruction of digital evidence. Michael W. Graves has worked as an IT professional for over fifteen years as a network specialist, a security analyst and most recently as a forensic analyst. He holds a Master of Science in Digital Investigation from Champain College, where he spent several semesters as an Adjunct Professor of Computer Science. His publications include a number of certification manuals for several of the CompTIA certifications, as well as two novels. When not poking around in computers or writing books, he carts around an 8x10 view camera and makes black and white landscape photographs with a nod toward the F64 school of photography.